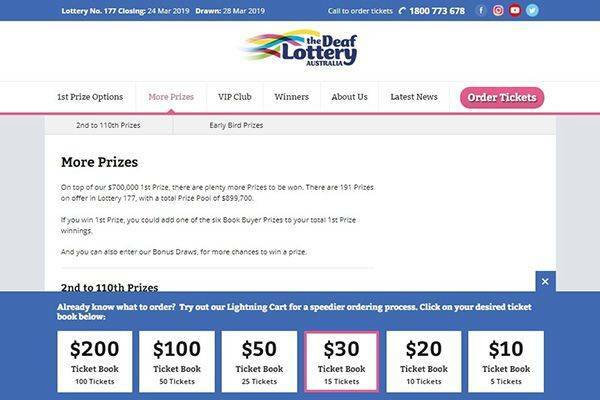 The Deaf Lottery Australia offers players the opportunity to win from any of their seven draws/lotteries run each year with each draw allowing them to sell up to 1,350,000 tickets. Deaf Lottery encourages interested players to buy subscriptions (while having a variety of extra prizes). The more the tickets you buy, the more you can win. The earlier you get in, the more prize opportunities there are. Deaf Lottery offers 181 Prizes for players to win, creating more chances than most lotteries for players to win several prizes and bonuses as well. This totals a prize Pool of $847,700. 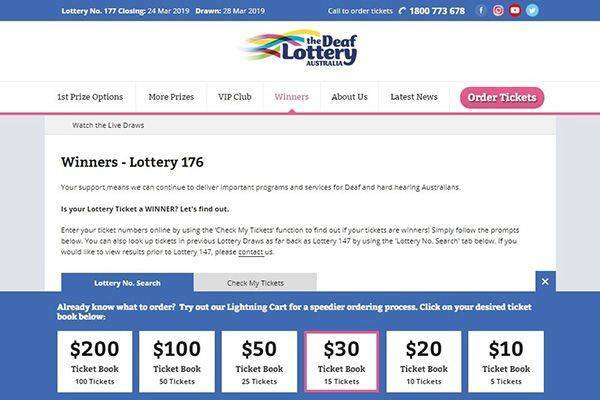 The Deaf Lottery Australia runs seven lotteries every single year and tickets are sold at $2 each. Tickets are sold in books of $10, $20, $30, $50, $100 and $200. Deaf Lottery offers no mega jackpots and only runs seven times every year (limiting how much people can win in an entire years even though there are many prizes to be won). Deaf Lottery makes use of a standard game-play, the traditional gameplay format of selecting and guessing winning numbers. There are special offers including Early Bird Prize Draws, Facebook Promotion Draws, and Extra Ticket Buyer Draw. Yearly, Deaf Lottery runs seven lotteries. 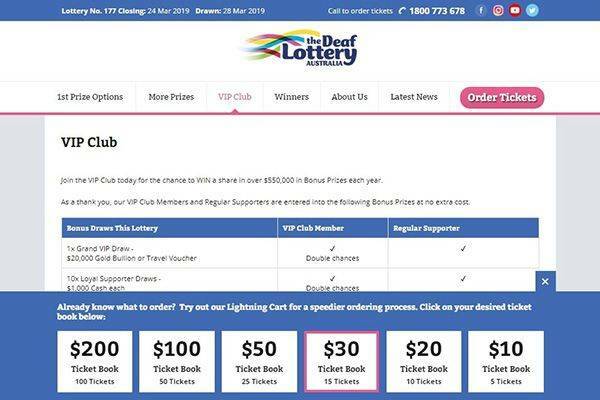 Prizes in the Deaf Lottery are interesting [1st prize is valued at $525,000 (players can choose between a combo of gold bullion, cash, a credit for a deposit to Metricon Homes, cars and caravans or a personalized prize), other prizes include Eftpos Gift Cards to the value of $5000 (2nd prize), $3,000 (3rd prize), $2000 (4th & 5th prize), $1000 (6th to 10th prize) and $200 (11th to 100th prize)] and everyone from everywhere around the world is allowed to play while its earnings fund a noble cause. However, sadly the Deaf Lottery does not offer major jackpots like other regular lotteries. The Deaf Lottery Australia supports Australian Sign Language (Auslan) lessons by providing independent living support, interpretation, awareness training, employment services and support to families. Deaf lottery provides no mobile application for download but does provide an above average mobile experience through its website. Key features are available and the site retains its branded look and feel, so nothing is missed while visiting the site from a mobile device or tablet. There are a bunch of promotions made available by Deaf Lottery, first-time players get a “Full-Time Bonus Draw” (allows you win out of the five gift cards or travel vouchers valued at AUD 2,000). While tickets cost AUD 2.00, ordering subscription worth $20 or more allows players to become eligible for the $30,000 extra prizes in addition to the main prize. VIP Supporter (order 5 or more tickets for 3 or more lotteries in a row to become one) and enter for the additional prizes available ($15,000 gold bullion/travel or 10 Eftpos gift cards each valued at $500) plus inclusion in the weekly draws of $1,000, eight times. Other bonuses include Full-Time Bonus Draw. There are promo codes made available to players. Purchase of tickets can be done via telephone, online on their website, snail mail or by fax. Deposit methods allow the American Express, MasterCard, Visa, Diners Club and NAB. Players can pay via cheques or money orders. Deaf Lottery does not confirm its transactions with a lottery ticket scan. For claiming prizes, Deaf Lottery does not provide much information, but it would be easy to assume that their payment methods are disclosed to winners via telephone calls or emails and could very well be the same as the deposits options. 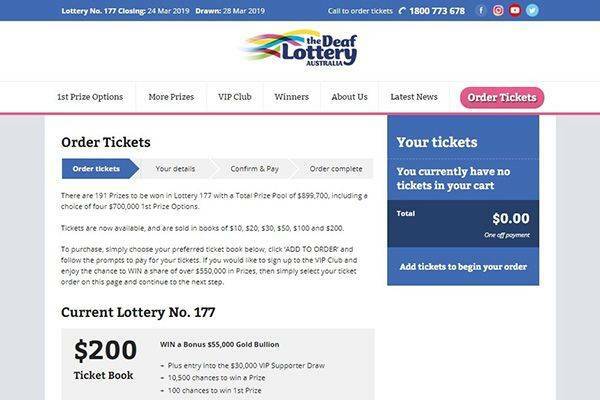 Is The Deaf Lottery a legitimate lottery or fraudulent? With a global ranking of 632,017 on Alexa ranking and an average of thirty-one thousand monthly visitors, the Deaf Lottery and its official website is as legit as it can be. 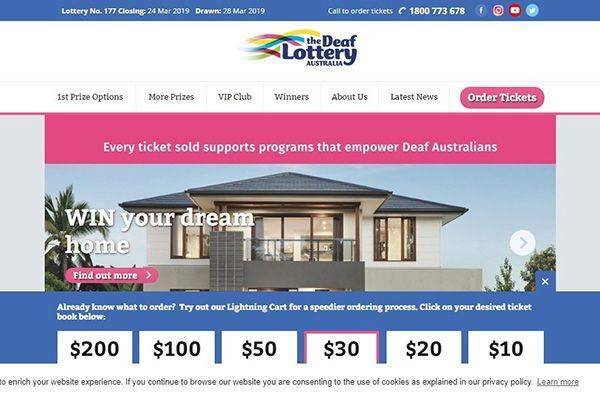 Deaf Lottery is registered at 467 Enoggera Road, Alderley QLD 4051 (Australia). The agent provides no information concerning its operating license but is secured by Google Safebrowsing and Norton Safeweb. Considering its reviews and ratings Deaf Lottery seems secure enough for players looking to play lottery games. Deaf Lottery offers winning chances to everyone around the world with a variety of prizes and bonus packages, also very high approval ratings and positive reviews. 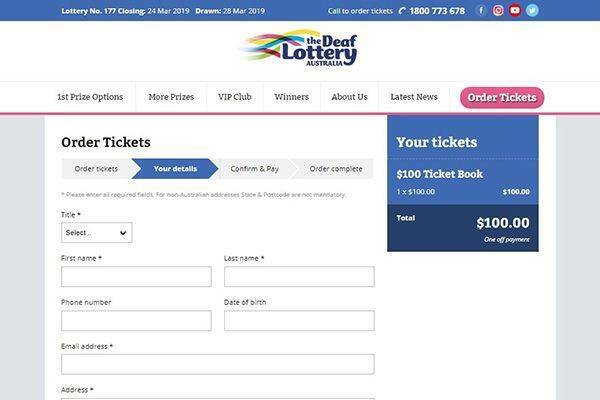 The Deaf Lottery is definitely a good lottery and its tickets cost very little. This is definitely a good lottery, not only because of the Gold Bullion but also because of your ticket purchase funds a good cause.